大腦相信大家一定會想到用”brain”, 但是既然是俚語，那就不會這麼普通啦! 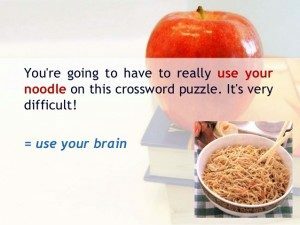 當外國人跟你說請你use your noodle的時候，並不是要你「用你的麵喔!」這樣也太搞笑了吧! 英文的口語當中，noodle有「大腦」的意思喔! 所以叫你用大腦的時候，不就是要你使用腦子想想嗎? 所以這樣解釋後應該就比較好理解了吧! 這裡要稍微注意一下，noodle這裡是不用加S的喔! You can do better in English if you'll just use your head. Tom: Shelly uses her noggin and gets things done correctly. Jacky: Yes, she sure knows how to use her noodle. 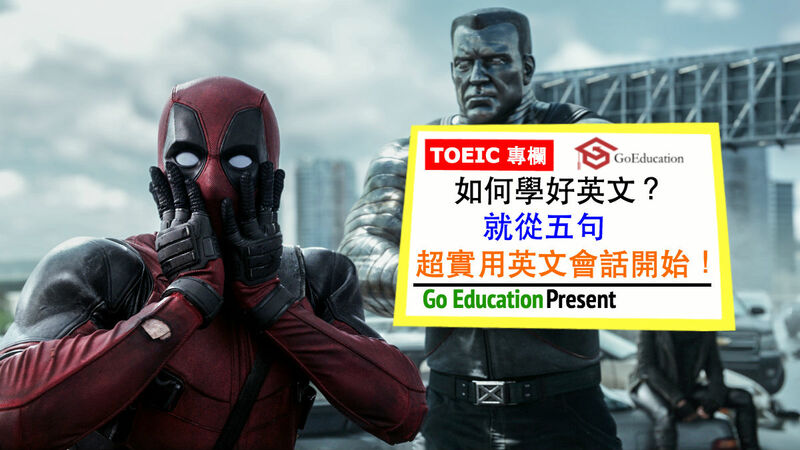 說明: 以上的 "use your head” 以及 "use her noggin” 也是表達「用大腦想想」的意思喔! 2. 我們隨機應變吧! play it by ear. 隨機應變的意思就是在毫無準備或者是計畫的情況下，來臨場反應當下要怎麼做！ 所以在英文當中會使用”play it by ear”來表示這種「隨機應變」的意思喔! Amy: I don’t think I have enough time for our speech tomorrow! Ken: So I guess we’ll have to play it by ear. 當你有話直說的時候，大部分都是指你毫不猶豫地說出你的想法或感覺，根本不會考慮說出去的話會不會傷人或者是給別人難勘的後果! 在英文會用”make no bones about sth.”來表示有話直說喔! My boss made no bones about his dissatisfaction with my work performance. 這句話簡單來說可以用”It looks great!”，不過這應該是小學程度的用法啦! 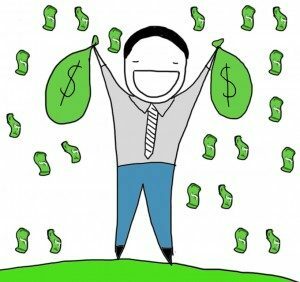 我們來看看今天的俚語用法叫做是”look/feel(like) a million dollars”，這句話不是在說某人看起來好像很有錢的樣子喔! 其實是在讚美喔! Bill: Wow! You look a million dollars! What’s the occasion? David: Thank you. I’m going to my sister’s wedding. 這句話同樣的在國中就教過啦! 小編想大家應該會直接用 "Please wait a minute!” 吧! 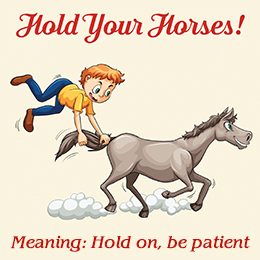 其實俚語用法的時候可以用 "hold your horses”, hold可以解釋成拉住的意思喔! 所以當你聽到這個用法的時候，千萬不要以為對方是要你拉住你的馬喔! 其實是要你先等一下的慣用語啦! Hold your horses! I don't see your invitation, sir! Hold your horses! Are you sure she’s the one that stole your cell phone? Although my mom has been sick for a few days, I’m glad she finally______ _____ ____ ______ _____today. They _______ ________ ________ _______ their dislike for each other. ________ _________ _______! I can't come yet, I haven't finished my homework. _________ ________ _______ to figure out the math problem. I believe you can do it. Don’t worry! Let's ______ _______ ________ ______.